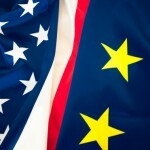 The international trade committee of the European Parliament (known as INTA) adopted a report yesterday on the controversial EU-US trade deal known as TTIP (Trans-Atlantic Trade & Investment Partnership). That report will now be presented to the European Parliament plenary session in Strasbourg the week after next, with votes likely on Wednesday 10 June. Former union official and now MEP Judith Kirton-Darling has reported in full on the INTA debate, and there is a lot to digest. 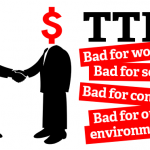 should ILO standards on workers’ rights be binding in TTIP? should the European Parliament explicitly reject Investor-State Dispute Settlement (ISDS) as a way of providing foreign investors with a privileged route to challenge (and be compensated for) democratic decisions taken by governments that may affect their future profits? The TUC will be urging MEPs to say yes to both (ok, no surprises there!) That doesn’t mean we support TTIP – we don’t, as Congress made clear last year. But Congress also urged us to continue to seek improvements, and if the Commission were to take note of the European Parliament in its negotiations with the US administration, yesterday’s report would represent some progress – but not yet enough. What INTA did was to endorse a series of demands that trade unions and others have been pressing for – an explicit carve out of public services from the deal, to protect them from further liberalisation and privatisation; defence of the regulatory protections for workers’ health and safety, consumer rights and the environment; and insistence that the ILO standards that both the US and EU say they want to see referred to in the deal should be binding. It criticised the basis for ISDS, but did not explicitly reject it, and suggested support for a better alternative system. The TUC totally opposes ISDS, and whilst we can see that a ‘better ISDS’ would improve on the current terrible system, our view remains that ‘no ISDS’ is better than any reform or alternative. So overall, out of the four key demands we have encouraged MEPs to back (our action is still relevant, because we need to defend what we’ve won so far – please carry on encouraging people to contact their MEPs), we won on 3, and have more to do on the fourth. 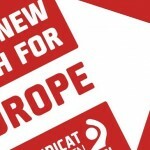 In the Canada-EU deal that has already been completed – although not yet adopted finally, so watch this space for more campaigning on that – all we get if people violate our core ILO rights (no forced or child labour, no discrimination at work, and freedom to join unions and bargain collectively) is a stiffly worded report from an expert committee. That’s not good enough: we want these workplace rights to be binding, and enforceable in the same way every other aspect of the trade deal is. BusinessEurope, the big business lobby in Europe to which the CBI belongs, are totally opposed to that. And until midnight before the INTA vote, centre-right parties (the Christian democrats, Liberal Democrats and Conservatives) were planning to push a vote deleting the demand for binding workers’ rights, but they were persuaded to back off in committee. They are likely to resurrect that amendment in the plenary debate in Strasbourg, so we need to defend the INTA report’s demand. The one UKIP member of INTA, the Earl of Dartmouth, moved an amendment excluding the NHS from TTIP and he was most put out when progressive MEPs refused to back him on the pretty obvious grounds that explicitly excluding “water, health, social services, social security systems and education” as well as all other public services did actually cover the NHS and went a great deal further. This could also come under threat in the plenary debate, as could the INTA report’s strong defence of Europe’s regulatory system and the precautionary principle, so we will also be making sure we carry on defending those points. But the big battle in the committee – and probably in the Parliament too – was about ISDS. It’s worth noting that INTA is far more neo-liberal on trade than the European Parliament as a whole, and that’s why progressive MEPs weren’t able to get an explicit ruling out of ISDS into the INTA report. We’ll back them in trying to get that agreed in the plenary session. The TUC has always argued that there should be no privileged route to settlements for foreign investors, especially when workers and consumers can’t rely on any binding mechanisms at all when our rights are infringed. So we are opposed to the alternative solutions that INTA – as well as EU Trade Commissioner Malmstrom – has proposed, like an international UN court just for foreign investors. But our main objective is to get rid of ISDS, and we’ll be concentrating on that in the next fortnight. One other EU body, the European Economic and Social Committee (EESC), could be helpful in that campaign. The EESC brings together employers, workers and civil society from every country in the EU, and yesterday it adopted a report on ISDS drafted by the TUC’s Sandy Boyle. Employers tried there, too, to defend ISDS, but their attempts to produce a minority report backfired, and led to a 4:1 vote in favour of a much tougher condemnation of ISDS than they would have had if they’d compromised. The majority in the EESC who voted for Sandy’s report included reasonable employers too, demonstrating that BusinessEurope doesn’t speak for everyone in the employer community. There is an argument that the Americans would give ILO Conventions for free. In many of the free trade deals with Latin America the Conventions have been included but to little effect. Often they are in a non-binding annex but even when in the main text are virtually unenforceable. See the latest edition of “International Union Rights” which explains that it has taken the unions in Guatemala seven years to get a hearing under the terms of the FTA on the most serious labour rights issues, the murder of union activists. As Thatcher and Major took UK workers and their unions outside the protection of ILO Conventions 87 and 98 (without renouncing the Conventions) how likely is it that Cameron would agree to a binding labour chapter? A different version of ISDS in exchange for the chimera of binding ILO Conventions seems a poor exchange. Adrian, I don’t think such a swap is on the table. What we’ll be pressing for in the European Parliament’s plenary session is binding commitments on ILO standards AND an explicit rejection of ISDS. There’s no trade off. And we also want to protect what the Committee decided on excluding all public services and no reduction in regulatory standards. I’m concerned that our Unions are (understandably) focusing on protecting members but NOT on finding a way of rejecting the entire bilateral/ignore the UN framework. 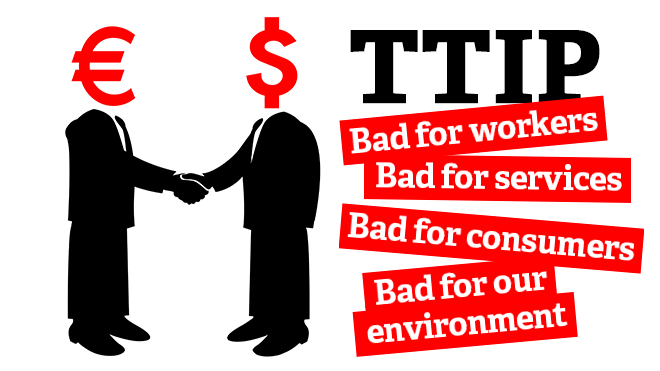 If Free Trade Agreements (TTIP/TISA/TPP…) are negotiated between the the “Big Boys” the rules globally will be set. What chance will those not at the table get to amend the rules when they want to join the agreement? When the rules of football are determined, can a new club change them? When the EU and US agree on freetrade in a sector will a country like Bangladesh, Jamaica or Mali be able to protect its interests in that area? How many corner shops really gain when an ASDA opens next door? Can we really believe that corporations who are pushing for TTIP are really doing so because they are eager to jeopardise their short-term profits by protecting those who they are not accountable to?